Montreal – September 12, 2018 – The National Education Committee recently met in Montreal to review the progress of key initiatives – like advancing mental health and stopping anti-worker legislation. 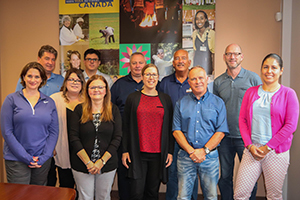 As one of the national union’s six standing committees, the Education Committee consists of local union representatives and national staff who work together to build engagement and create high-value resources for UFCW Canada members. Acting on a resolution passed unanimously by delegates to the 2017 National Convention, the committee reports that it’s moving “full steam ahead” on mental health training. Developed in cooperation with the Canadian Mental Health Association (CMHA), the new training will soon be available, and will address the growing issue of mental health in the workplace, and UFCW Canada core industries in particular. The committee is also taking action on the rise of Trump-style politics in Canada with the emergence of Doug Ford in Ontario. Starting this month, a new set of resources and presentations will be rolled out at UFCW stewards’ conferences across the country to ensure workers’ rights are respected and understood. The National Education Committee also shared initial feedback from members about the union’s newly released webCampusPLUS. Now up and running, webCampusPLUS combines the union’s award-winning online curriculum with D2L’s cutting edge technology, used by some of the world’s best universities and colleges. webCampusPLUS is available 24-7 and is completely FREE to all UFCW Canada members and their families. The other National Council committees are set to gather in Toronto next month.